Nicely Upgraded Two Bedroom with Loft & 3 Bath townhome located walking distance to the Canyon Lodge Ski Lift Area in Mammoth Lakes. Sleeps up to 8. The master bedroom has a king bed, the second bedroom has a queen bed, and the loft has a queen bed and a set of bunk beds. There is no sofa sleeper. 4 Flat Screen TV's, two VCRs, 2 DVDs and stereo/cd player. Phone in unit 760-934-6965 and WIFI Internet Access in the unit. Chef`s will enjoy the completely upgraded and remodeled kitchen with custom cabinets and stainless steel appliances. This remodel was completed December 2011. The townhome is aprox. 1300 sq. ft. of living space. The unit is 3 levels...you enter from an enclosed mudroom. The two bedrooms & 2 full baths are located on the first floor, the second floor is the living room, kitchen, dining room and the third floor is the loft. The third full bath is located off the stairwell halfway up to the loft and the loft is enclosed except for the stairwell area. There are 2 outside parking spaces available. Chamonix Recreation room with large screen TV, reading area, ping pong, foosball, and business center with fax, copier, computers w/ internet and laptop hook-up. Sauna, hydro spas, seasonal/summer swimming pool & BBQ area. Coin-operated laundry facilities located in the common area near the office. COMPLIMENTARY INTERNET and CABLE TV are provided, however NO REFUNDS will be given for connectivity problems or Internet failure. TOT LICENSE 1968-CX85. Hello Central Reservations team, Our stay at CX85 in Mammoth was really great. Loved our condo experience! Top things we liked: 1. Location to Canyon Lodge. 2. The extra room when you enter for all the snowboard gear and boots. 3. Layout and ktichen! Will definitely reach out again for future trips -t hank you! "Loved this place. Very nice and we liked the many levels. Location was a short walk to the lifts at Canyon Lodge and was convenient skiing 4 days here. Liked the wood burning fireplace as a touch to the condo which kept it quite warm in the living room. Was able to make a whole pot roast Christmas dinner for a family of 5 here. Would rent again. Enjoyed the stay in the condo. Condo is located near to the canyon lodge which is convenient. Kitchen is fully equipped for preparing dinner for a small group. There is a good collection of books, videos etc for indoor entertainment. Comfortably fit 8 people for 3 nights. 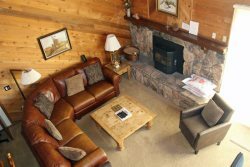 The cabin was clean and located very close to Canyon Lodge. Would definitely stay here again for a ski trip. Agree with one of the other comment. Home was better than what look in pics. Clean, spacious enough for 3 families. New property.. And we thoroughly enjoyed. Very nice stay! The place is actually nicer than what we see on the pictures! Coziness... Convenient location. Great condo with plenty of space to fit 6-8 people. Walking distance from the village and one of the mountain lodges. We used this cabin for Memorial Day weekend skiing. It was very nice clean cabin and accommodated 7 adults comfortably. Actually its me who needs to thank you for suggesting that unit when we spoke on the phone. It appears that there have been significant upgrades in the kitchen and baths which made it very enjoyable to stay there. The kitchen was very well stocked with utensils etc. Ive already recommended your service and that complex to some other friends of mine. It was so great. What a beautiful condo. And the prior emails were descriptive and very helpful. And the detailed check out checklist was very helpful. The combo lock to get the keys threw me for a bit of time, but thankfully my son got it!